Kentlands is one of the best examples of mixed-use development in the country with a distinct turn-of-the-century style. Classic American homes with white picket fences and front porches are surrounded by abundant green-space. 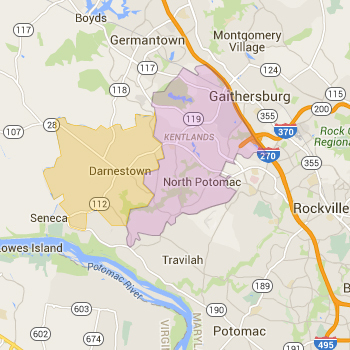 Kentlands and its younger sibling Lakelands share a vibrant commercial and retail area. Excluding condos, the median sales price for a home here is around $790,000. The median sale price for all types of homes is around $340,000. Most homes in Kentlands are assigned to the Quince Orchard High School, Lakelands Middle School and Rachel Carson Elementary School. Always verify a home's school assignment directly with MCPS.